Plans are being made to revitalize the walkways, recreational facilities and playgrounds of Ramsden Park, one of Toronto’s oldest and largest parks. The revitalization project will address important heritage concerns, increasing park usage, improving recreational facilities, and new tree plantings and landscaping. Construction is planned in three phases. 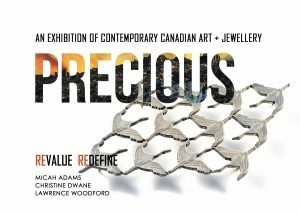 18Karat Studio + Gallery presents PRECIOUS, an exhibition that asks us to compare what we desire versus what we discard – to consider the ease with which we abdicate responsibility from items determined to be of ‘lesser-value’. By creating precious artwork and art jewellery from everyday, discarded and overlooked items, three Canadian artists Micah Adams, Christine Dwane and Lawrence Woodford remind us that our world is shaped by the decisions we make. Whether disposable or sustainable, beauty is everywhere we choose to look.